We had two appetizers at our Chinese New Year cooking club. Charissa brought chicken lettuce wraps. They were so good and easy to make! I've always wanted to make the knockoff P.F. 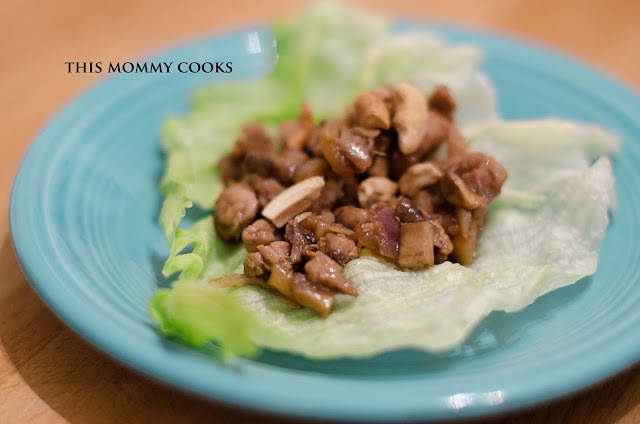 Chang's lettuce wraps but they have so many ingredients and look labor intensive. But, after hearing that these weren't too hard to make, I'll be putting them on our dinner menu plan soon because they were so good! Heat 1 tablespoon of the oil in a wok over high heat. (If you don't have a wok, just use a big pan.) Stir-fry the garlic and ginger for 10 seconds. Add the onion, mushrooms, and water chestnuts and stir-fry for 2 minutes. Remove the contents of the wok. Heat the remaining 2 tablespoons of oil in the wok. Swish the oil around, add the chicken, and brown for 1 minute, or until no longer pink. Add the cooked vegetable mixture back to the wok, decrease the heat, and stir in the sauce mixture. Stir for 1 minute, or until the sauce is heated and the chicken is cooked through. Spoon the filling in equal amounts into the lettuce cups. Top each lettuce cup with cilantro and sprinkle with chopped cashews if desired. Serve warm. I love these wraps and your version sounds great. Wish I could have been at your celebration; thank you for sharing this one. I usually see those wraps filled with ground beef, I love your version!